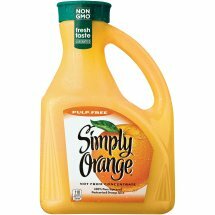 Simply Orange Pulp Free Orange Juice. Kosher for passover. Not from concentrate. 100% pure squeezed pasteurized. 110 calories per 8 fl oz serving. 100% Orange Juice Pasteurized Naturally Sodium Free No Water Or Preservatives Added.